Many visitors to India get to New Delhi, its current capital, but never get to nearby Old Delhi, once the capital of the powerful Mughal Empire and home to a mosque known for a single hair. In 1628, a Mughal prince killed his royal rivals, crowned himself the fifth Mughal Emperor, and gave himself the name Shah Jahan (King of the World). Three years later, Mumtaz, Shah Jahan’s favorite wife died during the birth of their 14th child and almost immediately he began building her tomb in his capital city of Agra. In 1639, while the Taj Mahal was still unfinished, Shah Jahan moved his capital to a location 130 miles northwest of Agra, where he built a walled city along the Yamuna River named Shahjahanabad (Shah Jahan’s City). In 1644, Shah Jahan ordered construction of an imposing mosque to serve his new capital. 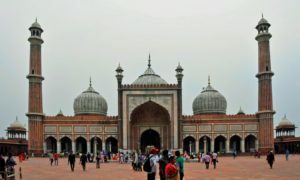 Five thousand artisans worked for six years building what became known as Jama Masjid (Friday Mosque), usually considered the largest mosque in India. The mosque features two 130-foot tall sandstone minarets, three large marble domes, and a four-acre courtyard for 25,000 worshippers. Today Shahjahanabad is known as Old Delhi, which is, depending on your point of view, either one of the noisiest and most chaotic places on earth or one of the most vibrant and fascinating. The Jama Masjid, at the end of hectic Chandni Chowk, is among the area’s most popular sites, open to the public except during daily prayers from noon to 1:30. For a fee, visitors can climb the 130 narrow steps inside the southern minaret to get a view of all of Old Delhi and the most important buildings of New Delhi to the west. Many visitors leave Jama Masjid unaware that it contains what is said to be a red hair from Muhammad’s beard.